The above quotation is from an editorial in the most popular newspaper published at the Capital of the United States. If the faith of the Church is to stand in the wisdom of men, then it will be the sport of every wind of doctrine, and be driven hither and thither, according to the course of the popular tide; and if the Church has no better anchor than the wisdom of this world, then, indeed, will it drift from all its moorings, and be tossed continually upon the seas of ceaseless speculation. But if faith is to stand, not in the wisdom of men, but in the power of God, in the sure Word of Truth that liveth and abideth forever, then, like its Divine Author, it is and will be the same yesterday, today, and forever. If faith be founded upon the Word of Eternal Truth, then the Church has an anchor sure and stedfast, entering into that within the veil. When wisely managed, disillusionment is a beneficial misery. It qualifies as what the Puritans called “a severe mercy”—a torment that purifies the soul. Since disillusionment is emotionally painful, we naturally regard it as an enemy. But to be disillusioned is to be set free from illusion, and that is never bad. Disillusionment bursts an illusion much as a pin pops a balloon. The experience is jarring; but in the case of illusions, it is equally liberating. Illusions are, of course, not real. They are enchanted dreams, deceptive mirages. Illusions may temporarily help us cope with the challenges of life—the little boy who is a gangster’s son may profit from the illusion that his father is a brave and principled man. But illusions that persist too long damage the soul—should this boy’s illusions never be demolished, he may well follow his father into a life of crime and become nothing more than a predatory thug. We find it particularly natural to adopt illusions in the early stages of covenantal relationships. A newly married couple entertains illusions about marriage and one another. New church members imbibe illusions about their church. But for every married couple and every church member, these illusions are eventually overwhelmed by reality. The illusion of a perfect marriage, the illusion of an ideal church, is eventually shattered. Wisdom - Wise People Crave It! About three years ago, I decided to preach through a single chapter of the book of Proverbs. No one, it seems, does this. Most sermons that address Proverbs are either solo shots or they cluster a number of proverbs by theme. But to get the most from the book—in my opinion—one must contemplate each specific proverb. Most of the proverbs in the book of Proverbs were written by Solomon, whom we also believe wrote Ecclesiastes and Song of Solomon. 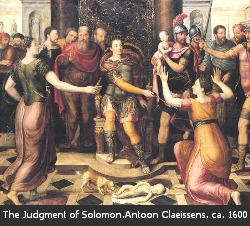 Solomon was noted for many things: his great power, his huge empire, his great wealth, his many wives and concubines (1,000 total, 1 Kings 11:3), and certainly his great wisdom. Solomon’s wisdom was a special gift from God, but Solomon himself often chose to make decisions that ignored the very wisdom he had asked God to give him. It is one thing to know the right course, another to follow it. When we deal with Solomon, his wisdom, and the nature of wisdom, we must narrow our focus. Here, I would like to highlight an important principle: wise people crave more and more wisdom, for wisdom is given to those who value it. Read more about Wisdom - Wise People Crave It!